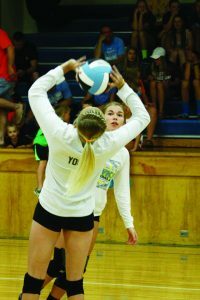 After placing fourth in the conference last year, the L-S volleyball team is looking for more success. Second-year coach Jayme Deal and assistant coach Kyra Smith are leading a 27-girl posse this year, which includes five returning starters. The team graduated five seniors last year and ended their season 13-7. They have been preparing throughout the summer and with official practice, which commenced on Aug. 7, for their first games this Saturday at a Grinnell tournament. The following is a Q-and-A with L-S Coach Deal. Senior Skyler Young sets the ball with classmate Camryn Russell watching, ready to hit during the Gat-orade scrimmage at L-S on Friday, Aug. 18. 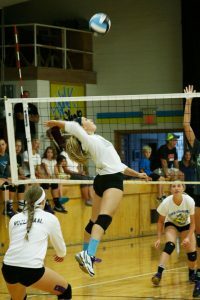 Senior McKinley Conover goes up for a kill in the Gatorade scrimmage on Friday night. A: We have been in the gym since March for open gym sessions, a few girls went to some college camps, and when the season started on Aug. 7-12, L-S Coach Smith and I held a technical/repetition camp. We then held two-a-days from the Aug. 14 through 17 that included conditioning and team/game-like situations. Our varsity girls went on a team-building trip to Dubuque to zipline over what used to be Union Park...a very fun trip! Eddyville-Blakesburg-Fremont invited our varsity girls to a scrimmage on Aug. 19 that really helped us as coaches and players see what we still need to work on. We have had a great pre-season warm-up and are ready for our season matches to start! We have some great athletes with a lot of dedication to this sport, and that will produce some great competition this year. These athletes put forth their best efforts for me, which will bring some much-deserved success. A: We have some seasoned players that serve as our strength. We are still working on our court communication, but as a whole, these athletes figure things out and can get out of a tough spot fairly quickly. Serve receive and block/-hitting coverage serve to be a weakness for us ... at least for now. Q: What is the SICL Conference looking like this season? I am proud to say that our conference looks tough this year. As a coach, I like a challenge versus an easy win, so this season looks like a lot of good competition! High school girls out for volleyball this year are, from left, front: Mariah Vos, Madison Johnson, McKinley Conover, Camryn Russell, Skyler Young; middle: Janelle Rozendaal, Kaylee Maasdam, Shiloh Cunningham, Makayla Rozendaal, Carson Fisk, Korinne Jansen, Baylee Jansen, Cally Gibbs, Elizabeth Squires, Bryar Hill; back row: Denali Conover, Coach Kyra Smith, Grace Fuchs, Caitlin Alberts, Meleisha Vos, Kayla Van Dyke, Krystal Van Dyke, Mallory Loftus, Shaleah Van Wyk, Jaden Brand, Courtney Gannaway, Coach Jayme Deal, Laci Keen; not pictured: Maddeline Mintle and Cayler Noun Harder.